India leads the world for regular mobile banking usage as a proportion of online consumers with current accounts, while Sweden has risen to second place in the global rankings thanks to the fastest growth of any country between 2016 and 2018, according to leading data and analytics company GlobalData. Consumers in the majority of global markets, both developed and developing, are using mobile banking services more often than ever before. 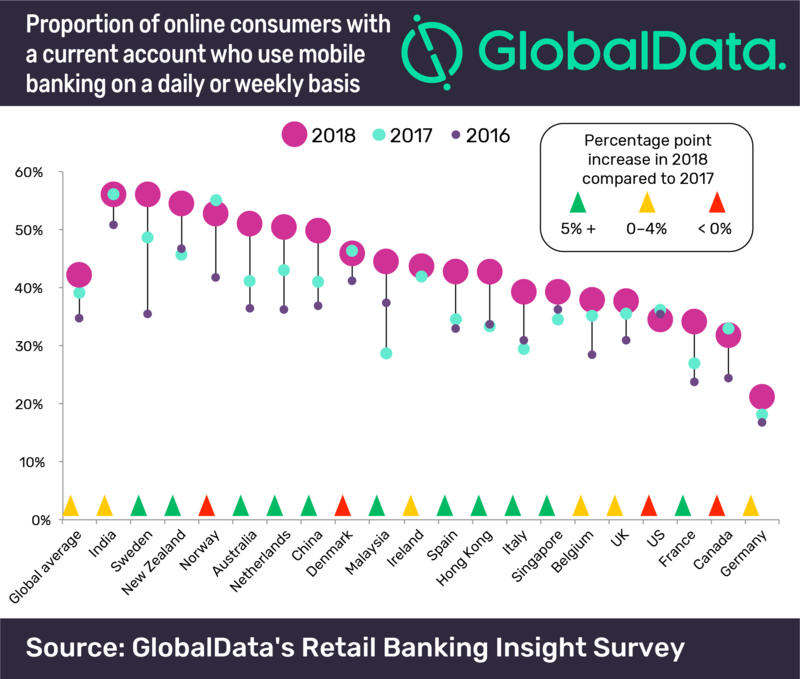 In 11 of the 20 countries covered by GlobalData’s Annual Retail Banking Insight Survey, the proportion of online consumers who use mobiles for banking at least once a week increased by at least five percentage points between 2017 and 2018. Overall, the global proportion of frequent mobile banking users witnessed a 3% growth from 39% in 2017 to 42% in 2018, but there was significant regional variation. Malaysia, Australia and Italy saw the biggest increases from 2017 to 2018, all having registered double-digit growth. Over the two-year period from 2016, Sweden witnessed the biggest gains, driven by the efforts of its banks and regulators to encourage a cashless society. At the other end of the scale, India, Norway, Demark, Canada and the US all registered negligible or negative growth. Daoud Fakhri, Principal Financial Analyst of Retail Banking at GlobalData, says: “India maintains a leading position, bolstered by the government’s demonetization program and the rapid uptake of Paytm’s mobile wallet. Previous research by GlobalData found that security fears are a major barrier to adoption by consumers, and banks need to gear up their public education programs to overcome these concerns. Analysts available for comment. Please contact the GlobalData Press Office at pr@globaldata.com.